The City of Saraland has joined with ten other area governmental entities in a combined effort to monitor and reduce the flow of pollutants into local drainage systems. Beginning in 1992, preliminary monitoring was conducted to ascertain the types and quantity of contaminants entering the various waterways of the area. Four years later the Alabama Department of Environmental Management issued the consortium its final discharge elimination permit that the city operates under at the present time. It is a five-year permit with reporting requirements. Its overall goal is improvement of the water quality of the entire watershed, including the terminus, Mobile Bay. How You Can Help Prevent Storm Water Pollution! Many products used around the house contain petroleum based chemicals and/or other non-biodegradable ingredients. Pouring chemicals down the drain, flushing them down the toilet, and dumping them on the ground can be dangerous to our surface and ground water. Cans and containers with residual chemicals could potentially leak toxins into the air, soil or groundwater, eventually making its way into the food chain. Landscape with native and drought resistant plants, thus reducing the need for water, fertilizer and pesticide use. Compost leaves and grass clippings to prevent the clogging of storm drains and ditches. Conserve water. By saving water you can help minimize storm water overflows at your wastewater treatment plant. Proper maintenance of your vehicle can protect your own safety as well as plants and animals that live in our area waters. Properly maintain your vehicle to protect your safety as well as plants and animals that lives in our area waters. Recycle oil. Take used oil to an oil recycling center, or a service center. 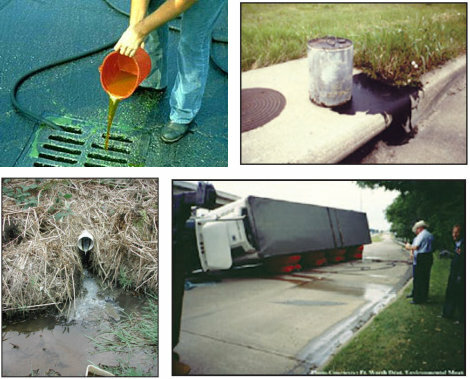 Never pour your used oil down a storm drain or on the ground. Maintain your vehicle. Correct fuel and oil leaks as soon as they are noticed. Wash cars on grass or sandy areas. This waters the lawn and allows the water to infiltrate into the ground and reduces runoff. Untreated wastewater may pollute the water we utilize for drinking water and household needs. It is currently against the law to impair the water quality of a creek, stream, or bay through the introduction of soil, chemicals, or litter. It is against the law to connect a storm drain to a sewer line or a sewer line to a storm drain. If you have knowledge of this type of violation, call the Alabama Department of Environmental Management (450-3400) or your local government official. Working with the City engineers, we can address requests for drainage pipe, sidewalks and roadway maintenance. If you have a concern, we ask that you fill out the Request for Ditch Cleaning or the Request for Street Repair and submit it online. The nature of street and drainage repairs requires us to be out of the office and away from the phones. We understand that leaving a message may sometimes seem frustrating. Submitting the forms online will help to alert us to an issue and allow for quicker response. Federal regulations define an illicit discharge as “…any discharge to an MS4 that is not composed entirely of stormwater…” with some exceptions. These exceptions include discharges from NPDES-permitted industrial sources and discharges from fire-fighting activities. Illicit discharges (see Table 1) are considered “illicit” because MS4s are not designed to accept, process, or discharge such non-stormwater wastes. Fill out the following form to report an illicit discharge. You may choose to remain anonymous. If you have any comments or questions regarding the City’s Storm Water Management Plan, please contact Public Works.